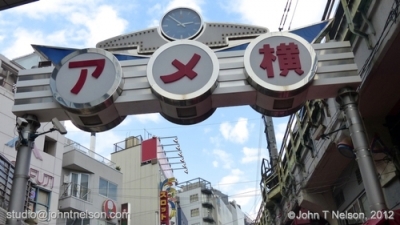 Again, we roll the dice… today’s adventure will be a return visit to the shopping district known as Ameyokocho in Ueno. In the years following WWII, Ueno Station became the gateway for migrants seeking work and prosperity in the city, and adjacent Ameyokocho something of a black market. Since those days, Ameyokocho has evolved into the legitimate street bazar, collection of open air stalls and shopping district you see today. Once again the Oedo subway line proves to be the most convenient jump off point to the Ginza line and then Ueno. From the subway exit we find ourselves before the Ueno train memorial. Then, we cross the street and enter Ameyokocho, the massive “under the train tracks” bazar and shopping district. Andrew is a little cagey about where he’s leading me but I think I know where we’re going: an Enka store where you can find all kinds of Enka recordings, in all kinds of formats from CD to cassette. This store is so small, only a couple people can fit inside at any one time. The wife of the proprietor greets us and proves to be not only an Enka expert, but totally knowledgeable about every single recording in her store. After much guidance from the proprietor’s wife, I select three Enka CDs, one featuring Ishikawa Saiyuri-san, and two CDs featuring a mix of old classic Enka songs. 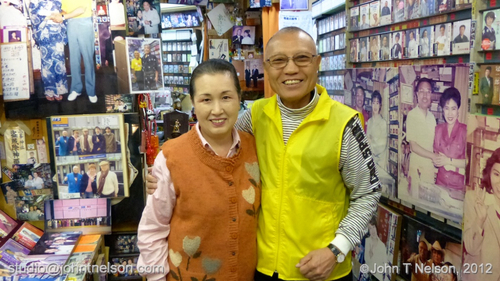 Before leaving, I just have to have a few photographs of this store and its owners. The store owners take our photos too and I’m sure our visit will end up on their wall with all of their other visitors and Enka celebrities. Andrew wants to take me to a rotisserie chicken place, but instead we have lunch at a hole in the wall filled with lovely old stylings and warm patrons enjoying their drinks and meals. Andrew has the tankatsu and I have the grilled mackerel dripping in fish oil and butter. We are introduced to Mugicha, an herbal tea made from roasted barley. It’s light and not as bitter as tea. Refreshed by a good lunch and bottled drinks from a vending machine we make our way to Ueno Park. I’ve been to Ameyokocho in the past and there’s little here for me to buy, so we decide to make our way to the next attraction, Ueno Park where there is a lake, zoo, temples and shrines, plenty of space to walk and museums.